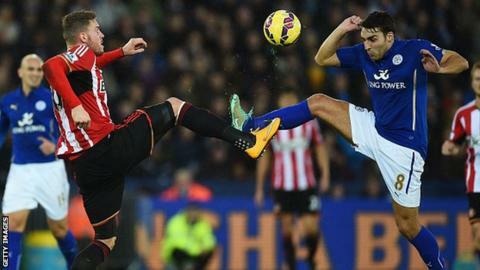 Leicester failed to score for a fifth game in succession as they battled out a goalless draw with Sunderland. In a match which both sides were desperate not to lose, the Foxes had the best of the chances with Jeffrey Schlupp and Matty James going close. Steven Fletcher missed Sunderland's best opportunity when he was denied from close range by Kasper Schmeichel. While the Black Cats are unbeaten in three, Leicester have taken just two points from the past 21 on offer. The Foxes began life back in the Premier League in impressive fashion and went seventh in the table when they beat Manchester United 5-3 in September. But they have failed to win any of their past seven games, and manager Nigel Pearson admitted before kick-off he is "concerned" about his side's form. In contrast, Sunderland have collected five points from their past three games to move three points clear of the relegation zone. Gus Poyet's players certainly performed better against the Foxes than they did the last time they returned after an international break, when they were trounced 8-0 at Southampton. They did start a little nervously as the home side, with Schlupp and Riyad Mahrez adding pace on the flanks, looked vibrant and determined to break a scoring duck that stretches back to October 4. Pearson's men did not look like a team that had lost their previous four matches as Marcin Wasilewski headed wide and Jamie Vardy pounced on a slip by Wes Brown only to be denied by Costel Pantilimon. After Schlupp's powerful shot hit the side rather than the back of the net, the visitors settled and created a fine chance when Adam Johnson's pass put Fletcher through. But the striker, who had recovered from the ankle injury which kept him out of Scotland's friendly with England, failed to add to his four goals for the season as Schmeichel made a good save. Leicester would have gone above Sunderland on goal difference with a win, and they gave it all they had in a second half in which they looked the likelier scorers. But Pantilimon twice made excellent stops to deny James as Leicester went a fifth match without scoring, their worst run in the top flight since January 1981. Sunderland skipper Lee Cattermole, returning after serving a suspension for collecting five bookings, received a sixth yellow card for a lunge on Esteban Cambiasso. Leicester boss Nigel Pearson: "I thought we played pretty well under the circumstances - after a difficult run of results - and created some good chances. You could argue we did enough to win the game. "Before today we had only kept one clean sheet, so there always positives from getting a point." Sunderland boss Gus Poyet on Lee Cattermole's yellow card: "Ten years ago his tackle would have been highlighted as one of the best in England. We are going soft. These people that never play football and don't have a clue are trying to make it a non-contact sport. It was a proper English tackle." Match ends, Leicester City 0, Sunderland 0. Second Half ends, Leicester City 0, Sunderland 0. Costel Pantilimon (Sunderland) wins a free kick in the defensive half. Hand ball by Connor Wickham (Sunderland). Connor Wickham (Sunderland) wins a free kick on the left wing. Substitution, Leicester City. Chris Wood replaces Leonardo Ulloa. Corner, Sunderland. Conceded by Wes Morgan. Substitution, Sunderland. William Buckley replaces Jordi Gómez. Ritchie de Laet (Leicester City) is shown the yellow card for a bad foul. Offside, Sunderland. Adam Johnson tries a through ball, but Santiago Vergini is caught offside. Corner, Sunderland. Conceded by Paul Konchesky. Substitution, Leicester City. Anthony Knockaert replaces Jeffrey Schlupp. Attempt missed. Leonardo Ulloa (Leicester City) header from the centre of the box misses to the right. Assisted by Matthew James with a cross following a corner. Corner, Leicester City. Conceded by Anthony Réveillere. Paul Konchesky (Leicester City) wins a free kick in the defensive half. Substitution, Sunderland. Liam Bridcutt replaces Sebastian Larsson. Attempt missed. David Nugent (Leicester City) right footed shot from outside the box misses to the left. Assisted by Leonardo Ulloa with a headed pass. Attempt missed. Riyad Mahrez (Leicester City) left footed shot from outside the box misses to the left. Assisted by Matthew James. Substitution, Leicester City. David Nugent replaces Jamie Vardy. Offside, Sunderland. Lee Cattermole tries a through ball, but Connor Wickham is caught offside. Corner, Sunderland. Conceded by Ritchie de Laet. Steven Fletcher (Sunderland) wins a free kick in the defensive half. Corner, Sunderland. Conceded by Kasper Schmeichel. Attempt saved. Steven Fletcher (Sunderland) left footed shot from the left side of the box is saved in the bottom left corner. Assisted by Adam Johnson.